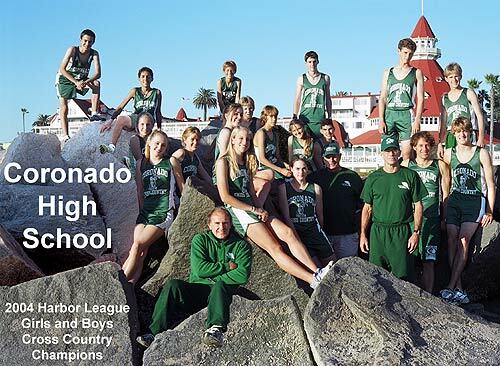 The photo above shows the 2004 boys and girls Harbor League cross country champions. For a key to the names and larger versions of parts of the photo click on the image itself (or the links below). It's divided into three parts... left, center and right. It's worthy of note that two of the track/Cross Country team members in the right section (Jake Ruzevick and Drew Lewis) were the 2004 - 2005 Valedictorians. Jake went to MIT, Drew the Naval Adademy. The previous season another T&F-XC athlete, Katherine Wingert, was the 2003-2004 Co-Valedictorian. These are the type of kids you see a lot of with our two sports. Both the girls and boys teams posted 4-0 dual meet records to win Habor League titles. Girls Triple Jump: 33' 6.5"
Results are basically the original articles submitted to the Coronado Eagle by George Green before editing. Jamie Klages and Reid McLean qualified for the state championships to be held at Sacramento this weekend.